Read nextTomTom Go Live 1005 review: is there still any point to the peripheral GPS? Nokia’s latest ambition? That would be to be the companion on your dashboard. The Finnish mobile giant announced today that its HERE navigation system is moving beyond your smart device and into your car with an embedded system called HERE Auto. Targeted at car makers and the manufacturers of in-vehicle systems, HERE Auto is aiming to be the bridge between your devices by allowing you to sync information from your computer or phone to your car, via the cloud. Say for example you’re looking up an address on the HERE website or on your phone before climbing in your car — Nokia’s linked system will ensure your car knows what you were just searching, so it can help you on the way. HERE Auto also supports the type of turn-by-turn navigation you’d expect on an app, along with features like re-routing to avoid traffic, information about fuel prices, street-level images and the distance to the nearest fuel or charging station. It also harnesses the power of the crowd in a similar way to apps like Waze to give you information on speed cameras. And yes, it also works offline, if you’re planning a road trip to somewhere distant and deserted. 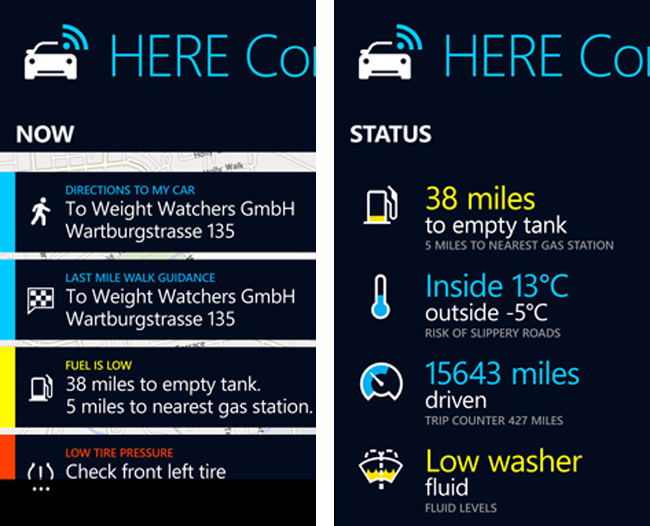 The HERE companion app for Android and Windows Phone also comes with some pretty nifty features — like the ability to tell you where you parked your car. Nokia’s even integrated features like the ability to control your car’s air conditioner, check tire pressure and fuel levels and lock and unlock your doors from your phone. Although Nokia says it is already drawing up partnerships with brands like Continental, the availability of these features is likely to vary from vehicle to vehicle. Nokia is opening up the system to developers, enabling manufacturers to include additional features like music playback into the system. Speaking to GigaOm, HERE VP of Connected Car Floris Van-De-Klashorst explained that HERE Auto is aiming to be a fully fledged in-car infotainment system, which is open to customisation by developers and car makers through an API. Internet radio and navigation on the go, anyone? 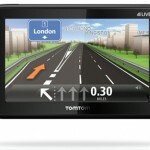 TomTom Go Live 1005 review: is there still any point to the peripheral GPS?